Durness is located in one of the most remote areas of mainland Scotland, way up in the far northwest corner of the country, close to Cape Wrath. It’s an area of unspoiled natural beauty, with miles of rugged coastline, vast tracts of barren moorland and isolated pockets of beautiful sandy beaches. It’s in this spectacular setting that the golf course at Durness Golf Club is set and it’s recognised as one of the true hidden gems of Scottish golf, featuring on many a “must play” list of golfers who’ve read about the beguiling attractions of this little 9-hole links layout. Established in 1988, the course was laid out by three golfing enthusiasts on land overlooking Balnakeil Bay and they configured the layout in such a way, with nine greens and eighteen tees, that an 18-hole round can be played quite comfortably. The 6th/15th is the only par five on the card and it’s a wonderful long hole, sweeping right around Loch Lanlish to the green. Fabulous though this hole undoubtedly is, the par three 9th /18th hole trumps it somewhat, as it calls for a tee shot to be played across a sea inlet to a small sand-protected green on the other side. They say that life’s all about the journey and not the destination but playing golf at Durness is without doubt both a journey and a destination. From whichever angle you approach this incomparable links in the remote North-West corner of Scotland, near Cape Wrath, your eyes will feast upon some of the finest scenery Scotland has to offer. The inherent beauty comes from its rugged, barren and at times desolate but always untouched nature. Located on the now-famous North Coast 500 trail, our own route from Inverness actually took us past Bonar-Bridge and Lairg before picking up the A838 that skirts the mesmeric Loch Shin. The final 50 miles, mostly covered on a single track road, is nothing short of sensational with an endless amount of photo opportunities. The drive into the small town of Durness itself is no less impressive and marks the end of a remarkable journey. For us, a trip that started in Huddersfield 12 hours earlier, 504 miles away. Upon arriving in the car park at the golf club, located at the end of a winding country lane past a church ruin and cemetery, you may want to allow some time to take in your surroundings and simply appreciate being alive. If you land on a nice day you will see crystal clear water lapping onto Balnakeil Beach in the near distance and the mighty dunes of Faraid Head on the opposite side of the Bay acting as a glorious backdrop. It’s probably the best view I have witnessed from a golf club car park. Importantly though, the golf course itself is a match for the journey. Not only is it golf in a beautiful, raw and expansive landscape but the shot values are very high. This is not gimmicky golf that you may expect in a location as unique and dramatic as this. There is minimal fuss both off and on the golf course. A mostly unmanned clubhouse has an honesty box to pop your modest green-fee into and a small lounge which boasts a fine view over the 18th green and out to sea. We paid just £15 for a round after 5pm. We played just nine holes and whilst another loop would have been more than desirable our golfing stomach felt full and content. Durness packs a lot of good golf into its nine holes. Nine was just enough and felt right. The sprawling property is one of its biggest assets. The big, top of the world feeling, enhances the joy to be alive factor. The spaciousness and backdrop add to the ‘one of a kind’ nature but again I must stress this is serious golf. There isn’t a really poor hole among the group. I’m not personally a fan of steep uphill approaches and that is what greets you at the first but from that moment on there are eight extremely solid golf holes; each one varied and each one so much fun to play. The last hole is the one that is talked about often at Durness; a mid-to-long iron over a rocky, vertigo inducing inlet to a green sat perilously close to the edge of the cliffs; my two-handicap playing partner took three attempts to find dry land. As I mentioned earlier, we departed West Yorkshire at 5am and 12 hours later arrived in Durness. We had travelled over 500 miles to get there; every one of them was worth it. It took us a little over 90 minutes to play the course as we walked the 2,753 yards to cover our nine holes; every step was worth it. Durness is both a journey and a destination. It took years of galavanting on golf trips elsewhere in the Highlands before I finally decided to make the 7-hour trip from Glasgow up to Durness last week. After you’ve gone the extra mile, driving through acres of rather bleak moorland on single track roads for large parts of the journey once you turn off the A9, you just hope the effort’s been worthwhile when you arrive at your destination. Well, Durness didn’t disappoint in any way whatsoever – what a location for a golf course, almost rivalling Traigh on the west coast for its sensational surroundings. The first two and last two holes overlook the unspoiled sands of Balnakeil Beach and the huge dunes to the north of the strand, with the remaining holes laid out further inland on rugged terrain around Loch Lanlish, where there’s more than a whiff of Askernish to these holes. The sequence from the 3rd to the 5th is particularly thrilling, featuring a sliver of a green on the first of these holes and a fabulous split fairway that rises up to the green on the short par four 5th. To be honest, I was a little underwhelmed by the short par five that plays round the loch at the 6th but the splendid uphill par three at the following hole, with its green benched into the hillside, more than made up for this minor let-down. The final two holes are just a joy; the 8th plunges straight downhill to the green and the 9th demands an all-or-nothing shot across a rocky cove to the home green in front of the wee clubhouse that clings to the side of the hillside. I don’t know if I’ll ever be back, but I’m so glad I’ve at least played here once, enjoying every moment spent walking its precipitous fairways and putting on its surprising well-contoured greens. 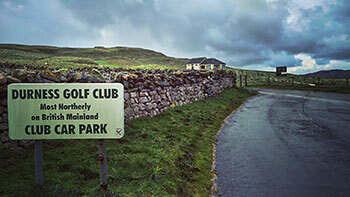 For sure, it does your soul no end of good when visiting golfing outposts like Durness. So glad you made it up to Durness. Really nice review, all I'd say is that the par 5 6th is a fantastic match play hole with a thrilling drive, and death or glory second if in the "go zone". Trickiest green on the course too. Can't wait to go back. Revisiting Durness after our previous 4 ball review the new, very young but very competent, green keeper has made the greens better yet still playable. The course is still possibly the most fun I've ever played, and the fact that you are pretty much guaranteed to have to drive through some of the most beautiful scenery on Earth to get there means that this will be an experience that will stay with you forever. And it's £20 for 9 or 18 holes ! The day we played in April was shirt sleeves weather despite there still being snow on the imposing Foinavon which dominates the view on holes 3 to 6. According to the review rules we must focus on all aspects of the course other than the facilities. In this case they are honesty based with changing rooms and a selection of chocolate bars and a kettle to make your own tea or coffee. After much debate we are upgrading Durness to six balls on the basis that we can't think of anywhere else we would rather have our next, or last, game of golf. I was visiting Durness and thought I'd pop in to see if I could get a game as I didn't imagine I'd be in Durness again as it is so remote. Once I'd found it, tucked away behind a derelict church, I was looking over a spectacular bay. Anyway I headed out without many great expectations just excited to be playing the most northerly course on the mainland. I loved it! The first eases you in but with great views from the green. The second is a tricky Par 4 into the wind. Then on the 3rd tee you know you are somewhere unique and special. In front a rising slope to a black and white marker with no other reference points, and the mountains in the distance. Behind the Balnakeil Beach. Such a beautiful place! The green on the third is by far the trickiest to hit as it is only roughly 10 paces wide. The 4th is another semi blind tee shot and then a tricky green to hit. The 5th was a drive able Par 4 hitting downwind. Only if you carry it over the large mound in the fairway. The 6th is in my opinion the signature hole a short Par 5 over water. Just beautiful. The 7th is a brutal 175 yard Par 3 into the wind. On the 8th tee you return the views of Balnakeil Bay with a strategic par 4. And then 9 is a cracking Par 3 over a cliff face back to the clubhouse. It is worth mentioning that even in mid November the greens were immaculate and actually quite pacey! I was smiling the whole way around (it was rainy with 30mph gusts too) and hope to return again soon. It's a proper experience that I don't think you will experience anywhere else. I've played all the Open rota course and many more aside but Durness for pure fun and enjoyment is now one of my favourite courses for sure. Lovely review, and from a whimsical point of view I should point out that the fairway markers are repurposed bollards and pelican crossing marker ! Durness Golf Club is an incredibly scenic, remote cliff top links at Cape Wrath. It’s a 9-hole course with sufficiently different sets of tees to change the challenge over 18 holes. It was incredibly windy when we played it, but the sun shone and a wonderful, natural game of golf was had. The greens are true but slow enough such that the wind won't blow the ball off the green! We played as a day trip from Dornoch, and the drive to Durness is part of the experience, passing along forbidding Loch Shin and the beautiful Loch More, with great views of Foinavon.